The casinos where this game is played do not accept US players. SupaJax is a unique online progressive video poker game developed by Microgaming, the leader in online casino systems. 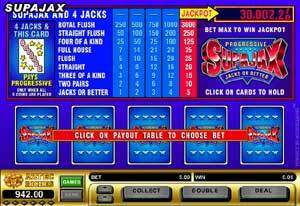 SupaJax is a Jacks or Better video poker game connected to multiple casinos powered by Microgaming's advanced casino systems. New casinos are joining this system and continuously adding to the overall jackpot being offered to SupaJax players. SupaJax accumulates deposits from it's players at all participating casinos and creates giant jackpots. If you have bet five coins and your hand contains four Jacks and the SupaJax card then you will win the PROGRESSIVE!!!! !